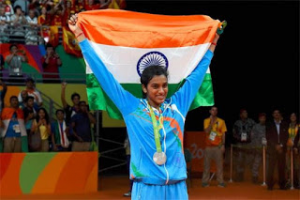 PV Sindhu became the first – ever woman Olympic silver medalist from India across all sporting disciplines, Sindhu ranked 10th in the world losing 21 – 19, 12 – 21, 15 – 21 against world no 1. Carolina Marin and settled for silver medal in the women’s singles badminton at the Rio Olympics on Friday. There was one last hurdle that Sindhu needed to cross in the women’s singles final at the Rio – Carolina Marin. And the 21-year-old seemed to be on the right track after she stunned the Spaniard with a fighting 21-19 win in the opening game. That came after she was down 6-11 at one point but fought back to run away with the lead. That Marin has been a dominant force in women badminton circuit for the past two odd years became evident in the second game when she pulled things back, opening up a 4-0 lead. Eventually, she got the better of Sindhu who came into the final on the back of some stunning performances wherein she beat world no 2 and 5 in the quarters and the semi-finals respectively. The Indian conceded the second game 12-21. In the decider, even though Marin maintained an upper hand, Sindhu never backed out of the challenge, clawing her way back every time her opponent presented with even the slightest of an opportunity. It was all even at 10-10 but Marin pulled out her a game and eventually rode the momentum to win 21-15. Heartbroken as Sindhu and her fans in India might have felt, she did left an indelible mark on the competition with her aggressive game and fighting spirit. Clinching a silver at Olympics is by no way a mean feat.